Chambers, looking more like a matinee idol than a Bible College principal! 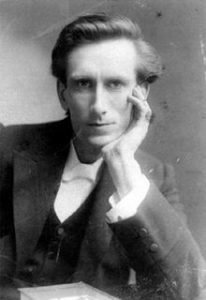 Those who follow Syzygy on social media may have noticed that every Friday for the last few months we have been publishing a quote from Oswald Chambers’ much-loved devotional My Utmost for his Highest. Chambers is well-known for his inspiring writing but the man himself is not often talked about. Which is just how he would have liked it! Born in Scotland in the 19th century, he was an artist, pastor, and principal of a Bible College who had experience of short-term mission in Japan. Passionate for the lost and oblivious to hierarchy and education, he ploughed his own furrow caring for the poor and ministering to anyone he came across. While running the YMCA in Cairo during the First World War, he surprised everyone by cancelling entertainments for soldiers from Australia and New Zealand who were billeted there, and replacing them with Bible studies, which proved to be amazingly popular as he encouraged the troops to live lives totally sold out for God. My Utmost for His Highest, published posthumously by his widow, contains numerous quotes about mission, which you can see if you trawl back through our feed. Although Chambers was not an overseas mission worker like other heroes we’ve highlighted in the past, we nevertheless remain inspired by not only his passion for God but his absolute dedication to seeing God glorified through his life. Which is good advice for any mission worker.